For coders however, this can be a stressful time. Sunshine is blocking the brightness of their screen, computers are overheating more rapidly and online servers are a desolate place. So what to do for coders on a sunny day? Well... code outside, of course! Here is a list of 6 things you can do outside that involve coding. Scratch Unplugged is a board game developed by our friends at Codescool. It is perfectly suited for a life action outdoor game. Coders gather in teams of minimum 2 players and start coding their way through a field of bombs and walls. Draw your play field with chalk or use sticks and rope to make one on grass. You can find all the rules here: http://www.scratchunplugged.com/. Got a Makey Makey at home? During a hot day, coders can try to make a piano with water. Check the video for some inspiration. Want to make it even harder? Let them try to make a D-pad with water. Their Scratch game will suddenly turn into a refreshing outdoor game. Be careful: water and electronics don’t do well together. Try to make everything as waterproof as you can or reduce the splashing to a minimum. It’s hot outside. But is it hot enough to be called a heat wave? Coders can find out with their very own weather station. The basic Arduino set gets them a long way but with some add-ons, they can really turn this thing into a mini KMI/IRM. Make them present a weather talk to their parents every night! Find a ‘how to’ here: https://makezine.com/2015/11/20/build-your-own-arduino-weather-station/. Coders can play hide and seek with a micro:bit. Use one micro:bit to find another. Peter wrote an excellent article on this subject in last month’s newsletter. 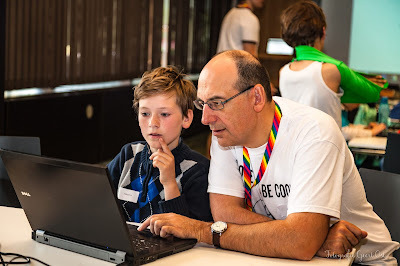 Read it here: http://blog.coderdojobelgium.be/2018/06/sos-microbit.html. The very young coders can learn the principles of coding (the if-then statement) by playing the If-then backyard coding game for kids. It’s a simple game. One player is the coder, the others act as computers. The coder gives commands, and the computers have to follow. You can make the game harder by adding an if-then-else statement. You can find more info here: https://leftbraincraftbrain.com/if-then-backyard-coding-game-for-kids/. We all know the wire loop game from your local village fair, but did you know it is rather easy to make one yourself? If you have a Makey Makey at home, your coders can probably figure out themselves how to make one. If not (here’s some inspiration: https://www.youtube.com/watch?v=TZVP51_5tz4). By adding a little scratch game, this can become even more fun. If you don’t have a Makey Makey (or you need a more challenging project) an Arduino (or other microcontroller) can be programmed to do the same. You can find a very extensive explanation on how to build one using an Arduino here: https://www.makeuseof.com/tag/make-buzz-wire-game-arduino/. Add a balls booth and you can host your own fun fair. Are your coders working on a project this summer? Did they have fun playing a coding game? Were they CoderDojo'ing in july or august? Send us some pictures and maybe we will feature their story in our next newsletter.